Profile: Greenspun College of Urban Affairs is home to the departments of Communications Studies, Criminal Justice, Environmental Studies, Public Administration, the School of Journalism and Media Studies, and the School of Social Work. The primary goal for the college is to explore the limits of new technologies, test new media products, and look for ways to bridge gaps between traditional and emerging media. The building was designed to facilitate research and promote collaborative work by students. 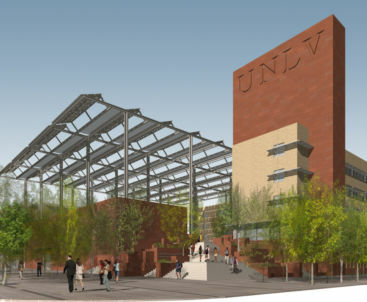 Comprised of five levels, the facility provides classrooms, labs, departmental suites, faculty offices, and state-of-the-art, digital, high-definition studios for KUNV radio and UNLV TV. Services: DataCom Design Group provided technology design, including audiovisual and acoustical consultation to support the extensive classroom, presentation and broadcast production space.